I recently had the opportunity to look at a 2014 Bounder 36K RV and as I did so I marvelled at how far these coaches (all coaches) have come in twenty (20) years since I purchased my first 1994 Bounder 34J. I thought it might be interesting to reflect upon the changes and improvements (generally) we enjoy today versus twenty (20) years ago. I looked at the coach under four topics: Body, Chassis, Interior and Features. A fifth area would be onthe‐road performance however we can only impute the improvements from the other four categories. In 1994 the coaches were 96" wide, with no slideouts and ranged in size from 28 to 34 feet. Today's Bounders range from 34 to 36 feet are 100"wide and have 2 slideouts. Exterior heights are about 6-8" higher today. The cargo bins were cut into the body sidewall and had uninsulated doors with two twist locks and a centre key lock to close. Hold open clips were mounted on the body to keep the flip up bin door open for access. Weather sealing was by means of foam tape applied to the interior door opening frame as the weather seal. The bins were carpeted and some went across under the floor allowing storage of large items. New Bounders have side opening, aluminum doors mounted on stainless steel hinges, substantial sealing trim and a locking door latch activating an edge mounted catch. Many doors use prop rods to hold the door open. The bins are Rotomolded plastic for easy washing out and are much larger both in internal size and access to them. The bins mounted in the main slideout have access from one end to accommodate larger items. The body fiberglass used in 1994 was a built up material which left the fiber visible under the finish surface. Shine was dependent on how much wax you applied. The sidewall extended from roof to bottom and the 1994 model introduced the now standard double pane windows. Accent striping consisted of multiple vinyl tape accents and Bounders had the trademark reflective orange and silver striping with large Kangaroo and upright Bounder logos on the front cap, under the drivers and passenger side windows and mounted high up on the recessed rear cap which was framed with metal. A steel 4" steel bumper graced the back of the coach, allowing for storage of long dump hoses while the front had a heavy plastic formed bumper with the dual headlights recessed into it. In 2014 the body is a smooth gel coat finished fiberglass material extending from the roof to the floor level, with multi‐color paint striping and subdued Bounder logos without the trademark kangaroo on the body sides. The front and rear caps are one molded piece with no bumpers and the lower front panel can be equipped with a Diamond Shield finish protection. The roof material on the 1994 was a rubber material that required constant maintenance to prevent leaching of the material sown the sidewalls. The 2014 roof is a TPO material that is much less maintenance intensive. The standard side mirrors back in 1994 were manual adjustable, although electrically adjustable and heated single panel mirrors were optional. In 2014 not only are the mirrors heated and adjustable double glass versions, they incorporate the side view camera. 2014 Bounders have an outside flat screen TV integrated into the body side to allow TV viewing while sitting under the standard electric awning. In 1994 awnings were a dealer installed option. In 1994 the two chassis choices were the Ford F53 17,500lb equipped with a 460 cu. in. V8 fuel injected engine mated to a 4 speed automatic with overdrive transmission; and the Chevrolet P30 16,000lb. equipped with a 454 cu. in., throttle body injected V8 engine, mated to a 4 speed overdrive transmission. The Ford had larger frame rails and was a heavier chassis than the Chevy however both had about 1,000 to 1,500 lbs. of cargo capacity. The Ford powertrain did not require a catalytic converter while the Chevy did. Power was slightly higher on the Ford at 230 hp. The Ford had 16.5" tires and wheels while the Chevy had tall 19" wheels and tires both well inset from the exterior of the coach bodies. Wheel covers were the norm in 1994. In 2014 the Ford Super Duty 22,000-24000 lb. F53 chassis are the only choices. All are equipped with the 6.8L Triton V10 providing 362 hp. and 457 ft.-lbs. of torque mated to a 5 speed Tow/Haul automatic transmission with overdrive. The chassis rides on 22.5" wheels and tires with aluminum wheels as standard and includes Bilstein shocks. Much more substantial engine, transmission and power steering cooling is provided in 2014 than was available back in 1994. The braking system includes ABS on all wheels versus just the rear axle in 1994. Carrying capacity is increased into the 3,000 lb. range. Turning angles allow the larger coaches of today to turn in a smaller diameter than the shorter ones in 1994. Instrumentation is extensive including transmission temperature, tachometer and oil pressure gauges all of which were not available in 1994. One often overlooked chassis feature often not available in 1994 is that the chassis extends the full vehicle length and that the wheelbases increase as the coach length increases. Chevy chassis in 1994 had to be extended by Fleetwood to allow a 34 foot coach to be built. This also meant that the towing capacity was limited to the capabilities of the additional chassis extension combined with the limited capacity of the chassis. Ratings of 1,500 to 3,000 lbs. 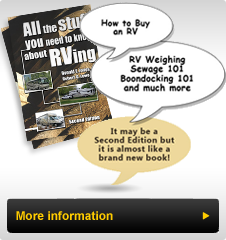 were the norm, although in 1994 most RVers did not tow a car. In 2014 hitch receivers are rated at 5,000 lbs. and a substantial 7 pin trailer wiring connector is standard. Rear overhang today is much less than what was available in 1994. In 1994 the 34J model had an offset floor plan with a side aisle leading to a private bedroom. While tight by today's standards this was far and away the most popular floor plan. From the mid entrance door the sink, stove and fridge were lined up curbside and then the offset hallway to the rear went beside the bathroom. The dinette was opposite the galley with a sofa ahead of it up towards the driver's seat and a chair and small table were behind the passenger seat. The air conditioning units jutted down from the ceiling and all controls were mounted on them. One was in the front area and one in the bedroom. The ceiling material was a carpet material. All blinds were a combination of wood and cloth manually adjusted to suit by pulling or releasing a cord. The exception was the kitchen blind which was metal for fire safety reasons. Lighting was incandescent often controlled by switches mounted on the lamps. These switches could be adjusted to turn on one or both bulbs within the fixture. As you approach the entry door to the 2014 Bounder you notice that the door is much closer to the front than it was on the 1994 Bounder. When you enter the 2014 coach you are immediately struck by the spaciousness of the interior since all models have a front slide out opposite the door. Large windows, a huge open floor space and extra height when compared to the narrow body non-slide 1994 34J Bounder. The one piece windshield and unobstructed forward view with no dropdown for the TV as was found on the 1994 add to the openness. The backup camera (now standard and in color) is in the center dash area not hanging from the overhead TV cabinet and includes side cameras automatically activated by the turn signal. The seats have far more style and comfort than the 1994 coach and getting into the seats is far easier with the low profile engine cover. Walking through the coach you immediately notice the ducted air conditioning vents and halogen lighting which are set into vinyl roof trim giving a smooth look to the ceiling which contrast to the manual controls and hand switched lights found in the 1994. A heat pump is part of the heating system now, however the solar panel first introduced on the 1994 Bounder is still present. Some of the features of the 2014 have been mentioned as I wandered through the description of the two coaches. However today discriminating and more experienced buyers are comparing many more coaches than was possible back in 1994. From four (4) to five (5) manufacturers, the number of coaches and options have blossomed. What features are included make up a big part of the decision to buy. For 2014 Bounder offers a convection microwave, large 12 cu. ft. refrigerator, stove cooktop with spark lighter, large double sinks with a home style kitchen tap with sprayer and an extra half bath and an optional washer/dryer. All of these features make this house on wheels far more functional than even John Crean would have dreamed of. The rear bathroom rivals those found in many homes in size and the mid coach extendable seating area is not only comfortable but spacious. The large shower is fed by a 10 gallon fast recovery water heater offers gas or electric heat sources versus the gas fired six gallon model found on the 1994. When it comes to TV's and entertainment systems, the advances are amazing. In 1994 a 20" tube type TV was standard up front in the overhead area with a crank up Winegard TV antenna with booster. There was an option for a small 12volt TV in the bedroom which would sit on top of a drawer stack and be held in place by a small railing on the top of the cabinet. Jump ahead 20 years and the flat screen 32" and large digital TV's are plentiful, connected to either an optional Auto Seek satellite dome antenna (though an optional receiver) or a digital Jack electronic TV antenna. All of the electronic systems including the HD home theater system can be powered by the 1200 watt inverter. A generator is included, which was optional in 1994. Our Bounder was one of the first to be equipped with the newly introduced Onan 5000 watt Marquis which was upgraded to the 5500 watt Marquis Gold a version of which is found in today's Bounder. While the large and plentiful windows can be covered by the standard pleated blinds, many will be ordered with the optional roller blinds that provide convenient shade and darkening functions. Some of the windows harken back to the 1994 torque style windows which can be left open to allow ventilation in rainy conditions. In 1994 the power was provided by a 30 amp system. To run two air conditioners on anything less than 30 amps a manual control switch was moved to select which air conditioner would receive power. Today's Bounder is supplied with 50 amp power and uses a Smart Energy Management system to manage the loads in priority. It providing poweIIumr to high priority items and drops less important ones when demand rises. A central electronic thermostat controls both air conditioners as well as the furnaces and maintains a pre‐set temperature electronically. In 1994 water was unfiltered, in 2014 the whole coach enjoys filtered water. The all plastic toilet in the 1994 has been upgraded to a porcelain one in 2014. Leveling in 1994 was often done by adding boards under the low tire(s) to bring up the offending corner(s) to close to level. Driving upon a stack of boards was a two person operation, one to drive and one to watch. Overdriving the boards was frequent and guessing how many boards to put under the tires became an art as much as a science. We were always concerned that the coach was level because the refrigerators of the day were much more sensitive to not being level. Today, pressing a few buttons and the coach is level without even doubting that the coach is level. Certainly the ability to operate slide-outs in today's coaches are dependent upon the proper operation of a leveling system. These slideouts are connected to a structurally strong and stable Power Platform that provides the bridge between the Ford chassis and the Fleetwood body structure. It is a strengthened unit that creates a unified structure providing enough rigidity to allow large slide outs to operate without stressing the body or chassis. A bonus is a larger storage area through the increased height of the floor mounted on top of the Power Platform. Basically in 2014 the chassis and the body are one integral unit, strong and stable providing better ride and handling characteristics, together with larger floor plans than could have even been dreamed of 20 years ago. Recently added options include electronic fireplaces that create a comfy area to lounge inside the 2014 Bounder. While this article may seem like a walk down memory lane, it really shows how far the Bounder (and RVs) have come in 20 years. Take a few moments and dream about what will be talked about in 2034. It's only 20 years however there will be even more advances in the next two decades. Will coach be smaller, more fuel efficient, lighter, more aerodynamic and laden with options that today would only be dreamed of? The winds of change are blowing. I for one look forward to the advances, while enjoying RVing now.